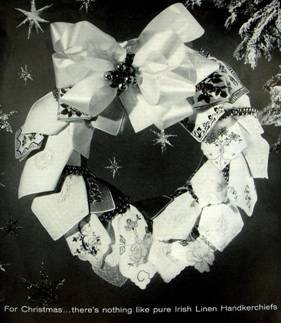 Even if a lady rarely received a handkerchief for a gift, come Christmastime, every mother, sister, daughter, aunt, mother-in-law, teacher, tutor, and favorite friend could count on Santa gracing her stocking with a beautiful embroidered hankie, or if she were really lucky, a boxed set of hankies under the tree. I do this every holiday, so you should be primed by now, however … QUICK! 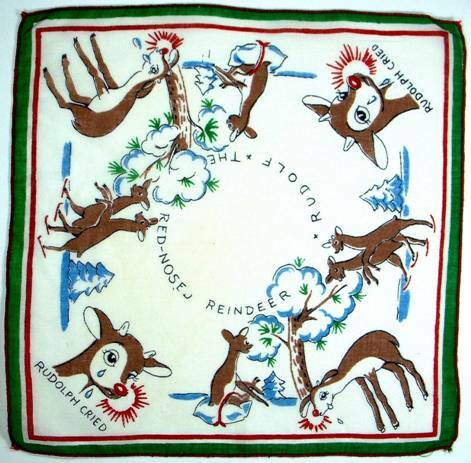 Name Santa’s eight reindeer. No fair googling…..STOP! …. No googling! (answer provided at the end) Stop scrolling down! We get so lazy with everything at our fingertips we sometimes fail to give our gray matter a work out. 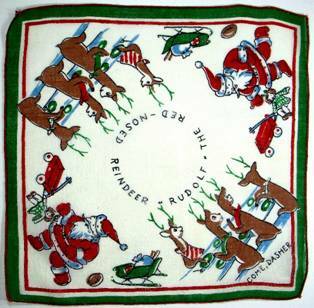 And….. who is the most famous reindeer of all? But he isn’t even on the team of eight. So how and when did Rudolph get so famous? 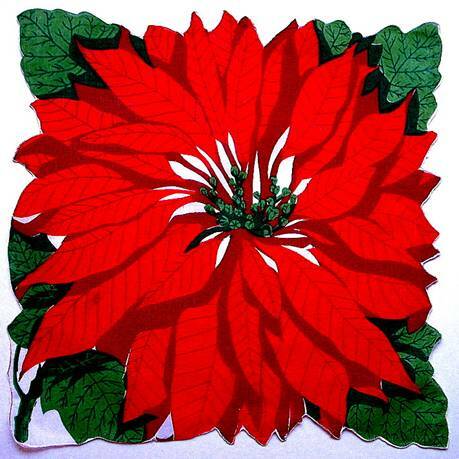 Clement Clark Moore wrote The Night Before Christmas in 1822, first published in December 1823. 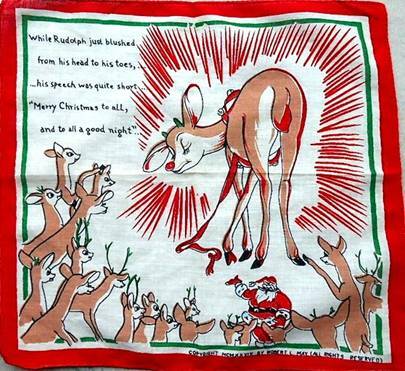 As for “branding” the folks at Team Rudolph were right on top of things with records, stuffed toys, handkerchiefs and more. 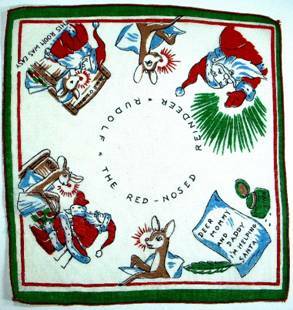 Yep, Rudy had his own Book o’ Hankies, complete with new verses added to the story. Here you’ll find 5 of the 6 hankies. 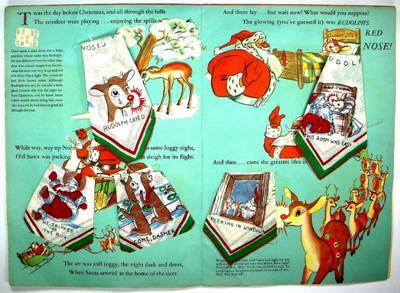 With the hankies removed, we learn the tale of a very foggy night when Santa rouses Rudolph from a warm bed (who knew?) 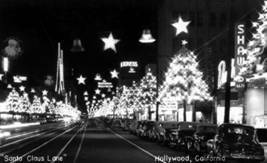 to light the way for his gift laden sleigh. We also discover a Montgomery Ward price tag revealing this once $1.00 book had been reduced after Christmas to .67 cents. Sigh……. 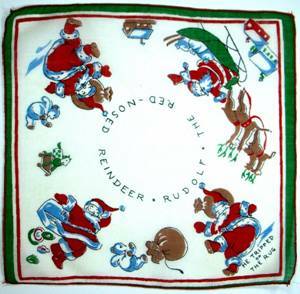 As the other deer skate merrily in pairs, outcast Rudolph tries his luck skidding along the ice with a pillow strapped to his backside. (Don’t ask. I have no idea…) That red lantern nose has him in tears. Answering Santa’s plea, Rudolph pens a quick goodbye to “Deer Mommy & Daddy” (in this instance, not a typo). Meanwhile St. Nick rallies the troops from the mess hall. Love the green antlers. 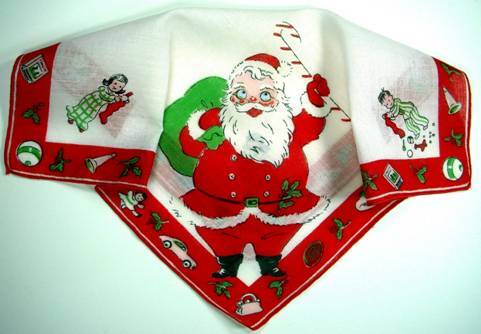 I’ve always wondered about that missing sixth hankie, and I did find it, although only as an image on Pinterst. 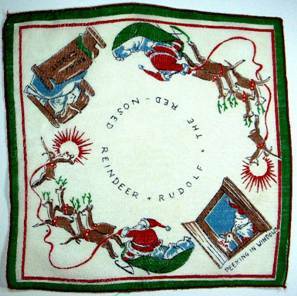 Not only does it have the Robert May copyright, we find the same Santa and green-antlered deer, as well as Rudy’s backward glance which can be seen on the reverse of the hankie folder. Santa Claus Lane Check out those cars! Parade Grand Marshalls have included Bob Hope,Jimmy Stewart, Charleton Heston, Roy Rogers and Dale Evans, Mickey Rooney, William Shatner, even Mickey and Minnie Mouse. Autry worked as a telegrapher for the St. Louis-San Francisco Railway, and used to sing and play the guitar to fill the lonely hours spent on the midnight shift. Although his hobby got him fired, humorist Will Rogers encouraged him to sing professionally, and eventually “Oklahoma’s Yodeling Cowboy” signed a contract with Columbia Records. He went on to appear in 93 films, 91 episodes of The Gene Autry Show, own a television station, radio stations and a major league baseball team. 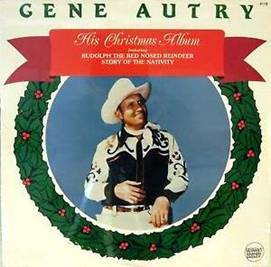 Although “Back in the Saddle Again” was his signature song, and he recorded over 600 songs, he is still fondly remembered for his Christmas tunes. Another great issue. You are amazing. 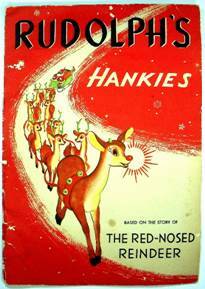 FYI Rudolph was written for Sears Roebuck & co. and was given away as an incentive of some sort. I did not know that May’s brother-in -law wrote the song. Sometime this week I will be listing a Child’s Chenille bathrobe with Rudolph on it. It is in practically mint condition. 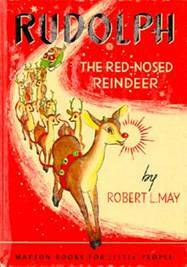 Hard to believe.There was a Rudolph shirt on ebay that went for over 200.00 I think I still may have one of the original Rudolph books around here, though lots of them did not survive. I look forward to seeing your blog.. Keep it up. Interesting. 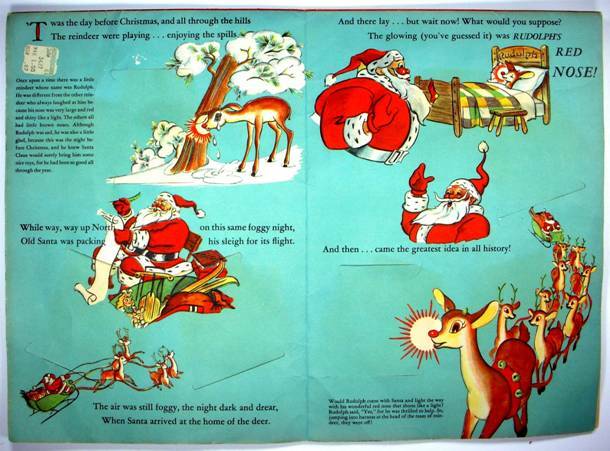 My research showed that Rudolph was created as a give-away holiday coloring book for Montgomery Ward, so I guess there are several stories floating around. Or should I say flying around. 🙂 Your Rudy bathrobe and shirt underscore the point about branding and line extension. had hankies dedicated to him ? Thanks for the great info. 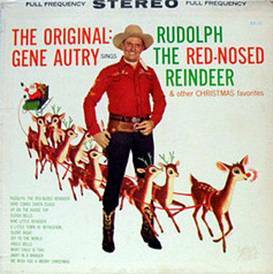 This made me both laugh heartily (at your joke about antlered critters running between brave Autry’s legs) and cry (“Deer Mommy and Daddy, I’m helping Santa”–it’s so earnest and sweet!). Love this and all your posts! I always treasure your eloquent stories! Thank you. And a very Happy New Year to you and yours!!! !